Conquering this book became something of an all-engrossing “project” for me over the past several months, one that I’m glad to have gone through and come out safely the other side. I daresay I’m a whole lot smarter about recent European history as well. I credit Tony Judt’s 2005 survey of Europe since 1945 as being the carrot that got me addicted to audiobooks last April, and over the course of five months, I listened to its entire 43 hours in chunks while commuting, before finishing it once and for all two weeks ago. Now I’ve got a monthly subscription to Audible audiobook downloads, and am concentrating on far more manageable 7-hour “reads” for the time being. I hope I can find another book this good in there. 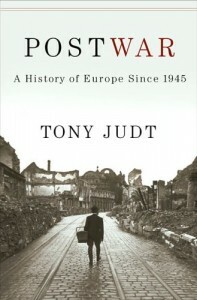 “POSTWAR” has been rightly hailed as a landmark achievement in historical non-fiction. It is a deep exploration of how a shattered Europe emerged from two horrific wars to become the Europe of today. At its heart is the story of Western Europe and Eastern Europe, two hitherto unknown constructs that turned into a huge rift once the USSR’s iron curtain came down in the wake of WWII. Each half of Europe had its own struggles, but the specter of Communism looms large over the bulk of the book, and Judt deftly seesaws between stories of Germany, England and France’s quick social and economic rejuvenation with the contrasting miseries of Poland, Hungary, Czechoslovakia etc. The book is chronological, starting of course with the immense cost of the war on humankind, and how each country’s people dealt with the confusing and controversial topics of “war criminals” and “collaborators”. You can watch all the WWII documentaries you want, but only a work of history this good will make you feel like you’re part of the shattered lives, destruction and mutual recriminations that follow a war of this magnitude. The early chapters on the Communist show trials that followed the war in Eastern Europe are amazing as well. Stalin consolidated his hold on “his” half of Europe because his Red Army were considered heroes across Europe for having stopped the Germans. Hatred and fear of Germany drove so many of the decisions made during this period – not just in Europe or the USSR, but in the United States’ reaction to it as well. The USSR, arguably justly, felt that they’d earned as much of Europe as they could possibly “take” through the deaths of millions of Russians over the past five years. They were welcomed as liberators in places like Hungary and Romania – only to be feared and hated as much as the Germans in due time. Judt takes us through the 1956 Hungarian uprising, the 1968 Prague Spring and smaller revolts in Poland and East Germany, and shows just what an effect the crushing of these “counter-revolutions” by the USSR had on the people trapped in these countries. The stale, stagnant Eastern European 1970s, with their worn-out, dead-eyed people and declining economics, are shown to be the result of a sort of weary resignation. No one in these years expected 1989 to happen – but I’m getting ahead of myself. In Western Europe, meanwhile, a period of “sorting-out” in the late 40s and early 50s quickly led to one of the greatest economic and baby booms the world has ever known. Judt portrays the Western Europeans of this era craving stability and normalcy above all, and shows how each of the non-dictatorship Western countries elected a series of interchangeable Social Democrats and Christian Democrats who all governed on exactly the same sort of milquetoast principles. This is exactly what Europe wanted and needed, and only in the 1990s and 2000s did this uniformity start to vary a little. You’d think a single book, even one of this length, could only intelligently touch on broad themes and not on smaller, country-specific events. The genius of this work is that I felt that I learned a ton about the Irish “troubles” of the 1960s and 70s; the Greek dictatorship of the same time; Franco’s Spain; the British miners’ strikes; the French, Italian and Swedish avant-garde film movements; the Communist chic that captivated so many of Western Europe’s youth in the 60s; Solidarity in Poland; and on and on. No major stone is unturned, and no significant chapter in Europe’s postwar history is written about with anything less than a brief but full sweep. I’ve only got one complaint about the book, and it is Judt’s bizarre reaction to Margaret Thatcher. After laying out what a dismal wreck the UK economy was in the 1970s and how it was socially coming apart at the seams, Judt details how, and to some extent why Thatcherism helped turn England back into a strong, prosperous and self-confident nation in a fairly short period of time. Judt keeps hinting at ominous “free-market capitalists” during his telling of the tale, while continuing to tick off the material and indisputable improvements in the life of the average Briton. At the end of this chapter, he still smugly concludes that it “came with a cost”, which he purports in a single sentence to have been social alienation and a general lack of respect for society’s downtrodden. Unlike in most of the book, no evidence for this is offered. It’s the sort of “Yes, but…” reflexive disgust one often sees on the Left for the achievements of the Right, and it’s totally sloppy and out of place here. Judt believes in a robust capitalist model tempered by a commitment to “social justice”, which is another way of saying that he believes in the Europe that developed during this timeframe into what it is now. There’s a sense I got that Judt believes it may have peaked in the 1980s or 90s, and he certainly pokes a lot of fun at the bureaucracy of the European Union. Early in the book, in the introduction, he posits that he will make a strong case for his belief in a capitalist/social democracy hybrid, and I kept waiting for the chapter that made this case before realize he was doing so the entire book. When the book’s timeline ends in 2005 or so, it’s on a hopeful note. Judt’s afterword is absolutely stunning and unexpected. It’s a long essay about Europe’s slow evolution into recognizing the Holocaust, and into public, rather than private, acknowledgement of just what happened to the Jews in its midst during WWII. He makes a convincing case that it wasn’t until the sappy late 70s TV miniseries “Holocaust” that Europe actually even began to talk about what had happened 30+ years earlier. It’s a fantastic piece of writing and a superlative piece of history that makes you challenge the received truths about this era with new eyes. This is one of those books to put on your reading bucket list. Forget “Ulysses” and “War & Peace” – you’re never going to read them anyway. I assure you, whether you take this in via print or via audio, it will open your mind to understanding the recent European past far better than any museum visit or series of documentary films. Unfortunately, Judt passed away not long after this masterpiece was finished, from ALS (Lou Gehrig’s Disease). It will be a testament to his genius as a historian, and I hope it becomes the standard work for students who seek to explore the fascinating history of what happened after the two most destructive wars of all time.